Can you sell something that you neither know nor understand? Visit some retail stores and you will see people trying, but it doesn’t work. The best sales people know their product, can explain the advantages of its features and connect them as benefits to the customers. In sales-speak, it’s knowing features, functions and benefits. Used effectively, FFB helps make the sale. As we are facing the historic, crippling, scary, panic-inducing prospect of winter storm Nemo (hype fully intentional) in the Northeast, the example of the common snow shovel seems appropriate. I know, snow shovels don’t need a lot of selling. The Weather Channel incites enough fear to guarantee a sell-out from New York to Bangor, but stick with me. 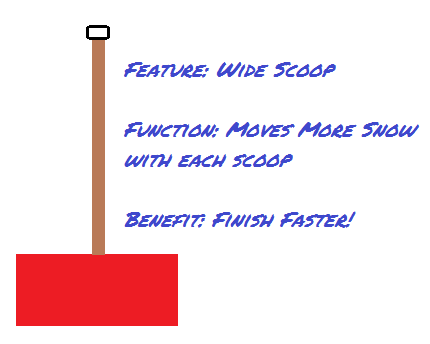 Our Snow Blaster 9000 has a key feature: an extra wide scoop. The function is that it can move a lot of snow in a single effort. The benefit is that the user can finish faster and get to his Swiss Miss Hot Chocolate with Mini Marshmallows faster. Simple! How does this translate to your job search? That’s simple, too. You are selling yourself, and as every skilled salesperson knows, you’ve got to know your product. When interviewing, you are selling your skills and abilities. You do that by giving examples of how you have demonstrated those abilities before. You wrap it up and make the sale by convincing the hiring manager that you will benefit the company in whatever way makes sense for the job. Let’s consider a marketing specialist. She has expertise in social media. In fact, she launched a page on Facebook and generated 100,000 likes in 30 days. She discusses with the hiring manager her ideas on how she can help the prospective employer grow its business by bringing these proven skills with her. She has explained her ability, given an example, and presented a compelling case that she will be able to benefit the new employer. Know yourself. Be ready to explain your abilities, examples and benefits. Make the buyer want the product: You! Can you sell yourself in 30 seconds? Check out “Question 1: Tell Me About Yourself” for more interviewing help. Today is the first day of the next step in my career and the first day of full-time self-employment. After years working for top employers, including Target, Edward Jones Investments, Kohl’s and others, Resu-mazing Services Company is now my sole focus. The experiences and responsibilities in the past have been tremendous as I have led teams of up to 500 people, focused on human resources, sales development and business operations and have gotten to know so many wonderful people whom I am fortunate to call friends. Today I must take everything that I have learned and make it work with my own business. I am sharing this letter with everyone for three reasons. Second, to convey my commitment to you, my clients. So many of the people I have been able to help have become friends. These are relationships that I value and I get excited when my friends have success. By making this work my professional specialty, I will be better able to serve everyone, existing and new clients alike. For Resu-mazing to continue its growth trajectory, I must give it more time. Third, you will be seeing new services from Resu-mazing. Being more accurate, you will hear more about existing services and a host of new services. You will see cloud-based value added services to make the Resu-mazing experience even better. One-stop personal branding and career marketing services, including pre-scheduled updates and content creation will be available very soon. These are just two services coming this summer. My family and I are looking forward to this next step in my career. I am looking forward to making even more friends as I help others find success in their searches. You can look forward to more and better services and a true partner in managing and advancing your career. Thank you for reading this and for your ongoing support of Resu-mazing Services Company! Bill Florin is a Certified Professional Résumé Writer and President of Resu-mazing Services Company in Monroe, Connecticut. Everyone is in sales. Whether you sell for a living or have to influence others in some way, you are selling ideas, products and yourself all the time. Having your eyes open to that fact will work to your advantage as you conduct a job search, and understanding some basic sales tactics can accelerate the process and get you doing what you love, your career of choice. Having worked in sales and sales management, I hope that these concepts that I have learned – some the hard way – can help you. Use Your Network. People buy from those that they trust. The best way to become trusted is with the recommendation of a valued and respected insider. Continue to build and energize your network, helping others as you can. The day may come when you need a favor (maybe you need one now) and the investment you made in time and energy will pay dividends. Sell What the Buyer Wants. You must understand the needs of the buyer. You are the seller, and the employer is considering buying your services. What is important to the company and what are the qualifications of the role? What is the organization’s culture and how would you fit in? Study the job posting, read the company’s website, research the organization through other sources (including insiders), and be ready to explain how you can help solve their problems. Focus on the needs of the organization and how you will be a great asset with the track record to prove it. Prepare, Prepare, Prepare. If you have ever been on a sales call, as the seller, the buyer or just an interested bystander, you know that a professional sales presentation can lead to success. The presentation includes the person (dress, grooming, professionalism), sales and marketing materials (leave-behinds, brochures), the content of the presentation and asking for the sale. As you sell yourself, you need to consider and plan for your interviews and other interactions. What will you say? What material will you present? How will you follow up? Multiple Contacts Increase Your Chances. This comes back to the point of trust. We don’t trust everyone we see from the first contact. That’s why you need to work to get your name, face, and work in front of the buyer as many times as you can and through as many channels as possible. At a minimum, this will include your initial contact, a phone interview, a face-to-face interview and follow up (thank you letter). You enhance your chances with a recommendation from an existing employee (back to your network). If you are in a less aggressive job search, consider a drip marketing campaign with potential employers, contact them once every 30 to 45 days with something of value. Consider these sales basics when marketing yourself, and put them into practice. Understand that as you enter the labor market you are a sales person, so be great at it. Spend six minutes in sales and you will hear that selling is a numbers game. You need to speak to a certain number of people each day and keep the pipeline or funnel full as prospects will leak out. A contact becomes a prospect and goes through the process until a sale is made or the prospect is written off and eliminated from the call list. A job search shares a lot in common. The product being sold is the job seeker. The prospects are the potential employers that might hire the candidate. Simple stuff. I spoke with a person recently whose story had me thinking about this. She had applied to over 200 jobs and had six or seven phone interviews, and not a single face-to-face interview or anything else beyond TBNT (thanks, but no thanks). Here are some points to consider about these numbers and what might be wrong. Applications to Phone Screens Ratio: The APS ration is what percentage of your applications are generating calls. If the number is low (6 for 200 qualifies), there might be a problem. What does the résumé look like? Does it have obvious defects? Are there obstacles in the candidate’s career history that need to be handled more effectively? Second, is the candidate applying for jobs that s/he is not qualified for or for which the résumé needs an adjustment? It is more work to customize the résumé for every job, but it’s worth it. Phone Screen to Face-to-Face Ratios: The P-to-F ratio (yes, I am making this up) is critical. Most phone screen interviews are simple and offer the candidate the advantage of being unseen by the interviewer. Notes and scripts should be ready to go and easily anticipated questions should be considered. Prepare answers. If less than half of the phone screens are resulting in interviews, it’s time for a tune up and practice. You get the idea. Look at each point that could derail a candidacy and work to reduce the chance of a negative outcome. Notes, practice and awareness of the critical nature of each interaction can make a big difference. Fix the leaks and land that next gig. Author Bill FlorinPosted on April 30, 2012 April 29, 2012 Categories career, career marketing, interviewing, job search, sales, unemployment, workTags sales funnel, sales pipelineLeave a comment on Are You Leaking Jobs? Why Are You Really Calling? Every organization that sells something, whether it is a tangible product, a service, or just an idea (think non-profits and politicians), has to reach out to its customers, and active existing customers are the best bets. After all, if I have purchased something from you or donated before, I may buy again. Anyone in business who has had any success has likely spent time and money cultivating existing relationships for additional sales and referrals. Why? It works. Can we get real about the sales call, though, and avoid pretending that the call is about something that it isn’t? My family has a subscription to a famous magazine, one with a long history, filled with pictures and featuring a yellow-bordered cover. You know the one. They called every day last week at about 10 AM. The phone would ring, I would look at the caller ID, say, “Oh, it’s them,” and ignore it. The answering machine would kick in and the caller would hang up. On the fifth day, I finally broke down and answered. The person on the other end of the call started by stating, “Hello, Mister Florin, this is Matt from the yellow covered magazine, and we are calling to say thank you for being a loyal subscriber. We are also going to send you a free gift – a world map poster – that is yours to keep just for previewing the blah-blah-blah DVD.” The call didn’t get much further than that, and I am pretty sure that they will not call again soon. Why do telemarketers feel like they have to start their calls with false pretenses? The thank you was not sincere, of course. It was just a way to keep me on the phone for a few seconds. Maybe there are people in the telemarketing industry who know better than I, but I can’t be the only one who finds the hollow thank you approach irritating. As business owners and leaders, don’t we have the obligation to be clear with our customers? Matt wasn’t calling to say thank you. He was calling to sell me something that I might enjoy. The next time you call your customers, be clear, concise and purposeful. I know I appreciate the direct approach, and they will too. Author Bill FlorinPosted on February 28, 2012 Categories business, communication, customer service, entrepreneurship, marketing, referral, salesTags repeat business, telemarketingLeave a comment on Why Are You Really Calling? “Hi. My name is Ralph, and I am wondering if you are hiring.” Ralph, in spite of his weak introduction, has stumbled upon a desperate potential employer, a company looking for a sales person and lacking good candidates. Ralph is told to take a seat and the receptionist whispers into the phone, while holding back an eye-roll, that Ralph is here. The sales manager, caught in a moment of boredom, steps into the lobby, greets Ralph, and shows him in to the conference room. The sales manager says, “So, Ralph, tell me about yourself and why you want to work here.” Ralph stutters and stammers, trying to come up with something in the moment that will sound good. A few minutes later, Ralph is back on the street wondering what went wrong. Ralph failed to plan, missing his big chance to present himself and make a good first impression. Everything that happened could have been anticipated, but Ralph failed to plan. Plan and practice an introduction. He knows that he is going to have to introduce himself, so he should have a great opening ready. Plan and practice his presentation for the manager. If he gets lucky and meets with a sales manager or hiring authority, he should know exactly what he is going to say when given the chance. No surprises. Gather names and contact information. Everyone he meets is a future recipient of a thank you note, an email or some other follow up communication. Dress for success and have the marketing material ready. This should be obvious, but it doesn’t hurt to mention that clean, professionally printed documents carried in a portfolio will add to his image. Bring plenty. Follow up immediately. I hope that my client already has his thank you cards and postage stamps ready to go. Those cards should be in the mail before the end of the day. I don’t know how this will work, but I will let you know. What I do know is that having a well-developed plan and working it will be a lot better than what Ralph did. I will let you know how it goes. The electronic ink flows faster than a western river after the spring melt as small business owners and entrepreneurs discuss how to grow their businesses. How can we get more customers? How can we sell more? How can we get referrals? Here is an idea: do what you said you were going to do and return calls. Here is a brief and hopefully not too boring example of what has got me stirred up this morning. My house needs a chimney repair. We called one local contractor who visited our home, scribbled a quote with his pencil on the back of a business card (really!) and told us that he really wanted to do the $1,600 job. We called him back to make the appointment. And called. And called again. Tony, where are you? As I sit writing this, I am waiting for another contractor who committed to a visit during a time window that ended 30 minutes ago. We called this guy from his colorful – and presumably not free – ad in one of those coupon magazines that fill the mailbox. Tick tock, tick tock. When I get inquiries from potential clients, I always respond right away. There are simple technology tricks to make this possible, solutions like smartphones to get emails and voice-to-text email alerts of office voicemails. Almost always, these people express delighted surprise that I get back to them so quickly because my competitors don’t. They lose, I win. I get paid, they don’t. Woody Allen famously commented that success is all about showing up. I think he was right. In business, success can come from something as simple: return the call. Show up and win the business, because others have not yet figured this out.